The leprosy colony is 15 kilometres from Adzopé. It is reached by a road running through the forest – a road which the Sisters beat out yard by yard, then imposed on the forest. Yard by yard over 15 kilometres! 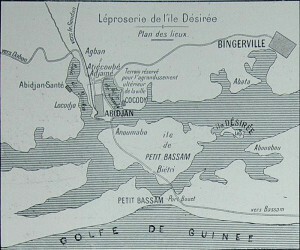 They threw thirteen bridges over the marigots, or branch-channels, inhabited by somnolent caymans. Nothing, no one, can give the faintest idea of this gigantic task. But when I exclaimed in wonder, Mother Julia said in her calm voice, “Oh, it was nothing.” And indeed it was nothing compared with what was to come.